Our Language Arts team often gets together to discuss areas of difficulty and to brainstorm solutions. Together they examine student work to find weaknesses, and research ways to improve their teaching. 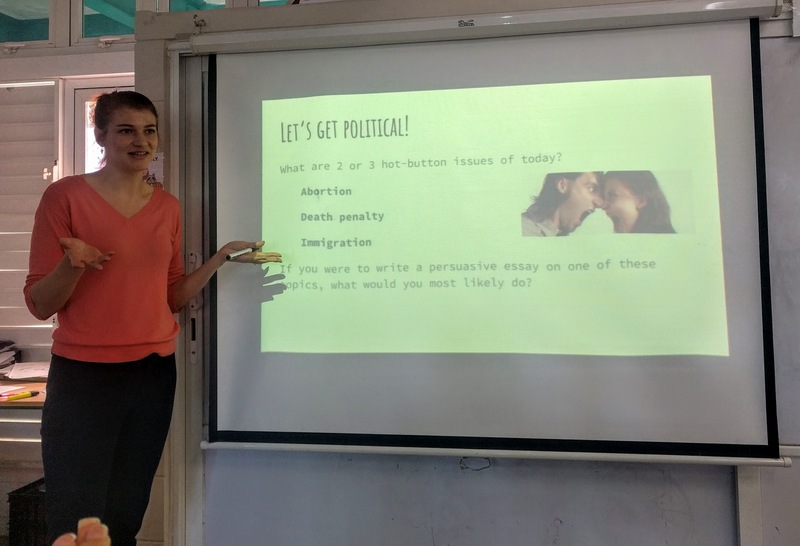 A few weeks ago, I was lucky enough to sit in on a lesson that Jean, our 11th and 12th grade Language Arts teacher, gave us about teaching theme. Most teachers struggle to teach theme, as their own definition may be a bit hazy and we find that students tend to confuse theme with “main idea” or “lesson.” Simply giving students a standard definition doesn’t seem to truly help them understand the difference between subject and theme, so Jean created a series of activities to help students discover what “theme” really means and shared it with our team. First Jean asked us to think of two to three hot-button issues going on in the world today. We brainstormed and came up with abortion, immigration, the death penalty, and health care, among others. She asked us what we would do if we were to write a persuasive essay on one of these topics. We decided that we would take a position on the issue and then look for facts to support our opinion. 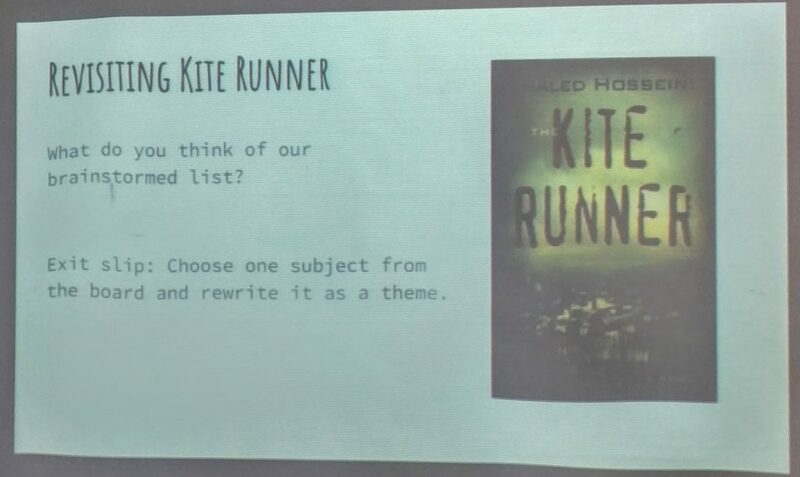 She went on to give us a definition of theme, which is “a central message in a literary work, its main idea or underlying meaning.” She then asked us to brainstorm a list of themes for the book The Kite Runner. 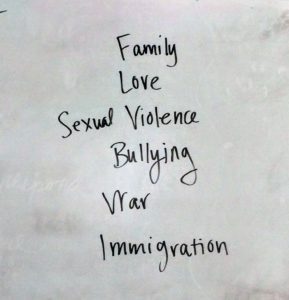 We came up with a list of ideas that included family, love, sexual violence, bullying, and immigration. 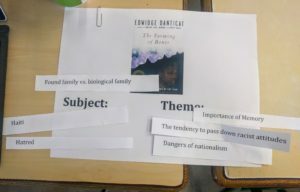 Jean then discussed the difference between subject and theme with us — and we muddled around with different ideas for a bit. With her nudging, we finally came up with this explanation: The subject is what the work is about, or the foundation for the work. Theme is an opinion expressed on the subject. Then came the fun part. Jean handed each of us a picture of a novel and a series of words and phrases… and it’s amazing how these strips of paper made our eyes light up! She asked us to divide them up under “subject” and “theme” using our definitions as a guide. Some of the words and phrases fell under one category simply, while others were more difficult and we discussed them amongst ourselves until we came up with a solution. 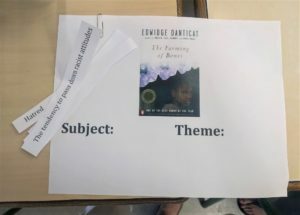 At first, there was a tendency to put the single words under subjects and the phrases under themes, but we soon realized that our sneaky little trick wouldn’t work, since some of the phrases didn’t seem to be themes. Once we’d finished the activity, Jean had us come up with our own ideas of what a theme was and we shared these ideas: longer than one word, a complete idea, judgmental, point of view, phrase, simple. It still wasn’t a perfect definition, but having discussed ideas and worked through activities together, we all ended up with a much clearer idea of what a theme actually is. As our exit slip, Jean asked us to go back to our original list of themes that we had brainstormed for The Kite Runner. Guess what? They were all subjects! Jean asked us to choose one, and turn it into a theme. Voila! A perfect mini-lesson. It was short, hands-on, we were actively engaged, and we all walked out with a much clearer understanding of that vague term: theme. But even more than the lesson, I love the way our teachers work as a team: sharing ideas, showing vulnerability, and growing together. Neat peek behind the curtain at this teaching/learning sequence. Thanks for sharing! Like all the tools of philosophic engagement used in this. Definite RT! Thanks Gillian! It seems so simple and yet it was a powerful lesson.